Hello, I am back in real time with photos taken in the last week as opposed to last year (see my previous post if you don't know what I'm taking about). 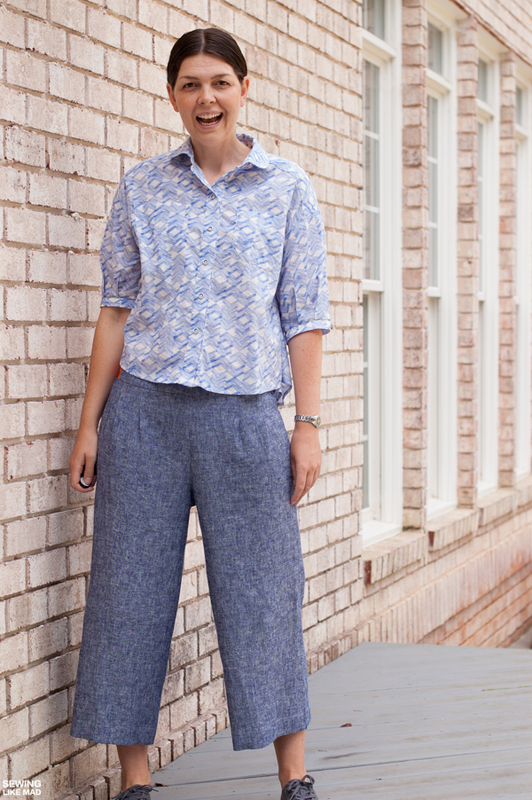 I have been blogging for over 4 years and this is the first time I'm showing women pants. About time! 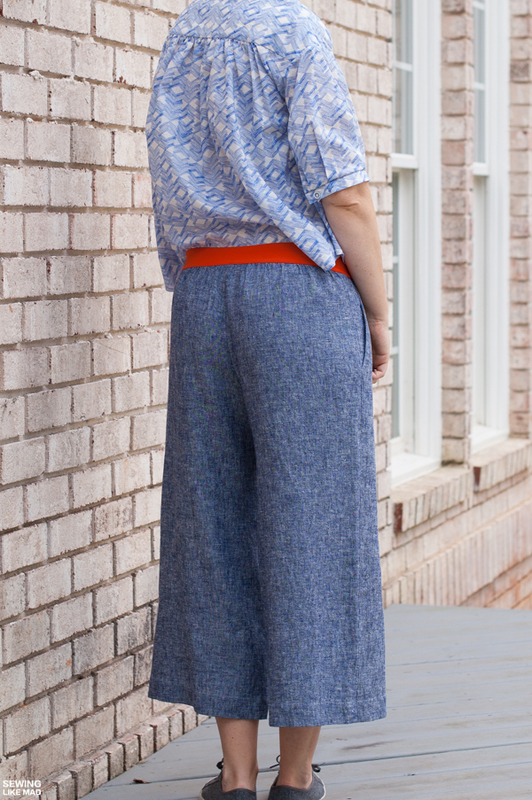 Let's just say that the Emerson Crop Pants pattern by True Bias made me do it! I do wear a lot of pants but they are all the jeans type and I didn't jump on the sew your own jeans wave. I have sewed lots of jeans in school - been there, done that I guess, he. I never considering wearing this style until I saw several bloggers, with a similar size/type behind to me, looking amazing in them. One of them is the designer herself Kelli. I have no idea what size she is but I don't think/hope I'm offending her when I'm saying we both have defined hips. See her wearing them HERE. No, these are not slimming-illusion pants (like jeans can be) but I don't think they are the opposite either. You look like the way you look in them and that is good enough for me! Emerson and I had a VERY rocky start. All 100% my fault - not the pattern. I took my hip measurement (103 cm / 40.5") and somehow I managed to look at the wrong numbers in the size chart in the tutorial. I honestly don't how that happened besides sheer stupidity from my side but I printed, cut out and sewed a size 8 (muslin, thank god) and I could barely squeeze myself into them. (and size 8 is my regular RTW here in the US - I'm a size 40 in pants in Europe). After some sweating and swearing I went back to the tutorial to double check and DUH...there it was black on white....hip measurements up to 104 cm should make a size 12. I'm not going to complain about the size chart being a bit off from most RTW sizes because it's just numbers (and if you are not measuring yourself before determining your size to sew, well then you are asking for it to go wrong (and don't look at the wrong numbers either, ha)) BUT I'm going to mention it, so you are informed and can skip the worrying about whether this is going to be too big for you. The size 12 was perfect and that is really all that matters! I have heard requests for photos of this pant from the behind so here you go. This also takes me to the area where I did make fit changes to the pattern. My muslin (the second one in the right size, ahem) has a back crotch seam that creeped up my bum (yeah, sorry not sure how to say that in a more elegant way, haha). That is a sign of not enough curve on the back crotch seam. This is going to be highly individual from person to person and not necessarily a sign of something wrong with the pattern. 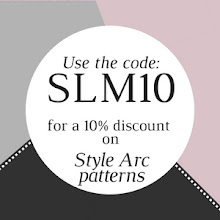 In fact to sew a pattern that needs no adjustments pattern wise would be nothing less of a miracle in my opinion - especially if you have curves. There is a reason why pants is usually not suggested as a total beginner projects. It's not necessarily because the sewing is harder (these are certainly not hard to sew) but because there is usually some fitting involved. 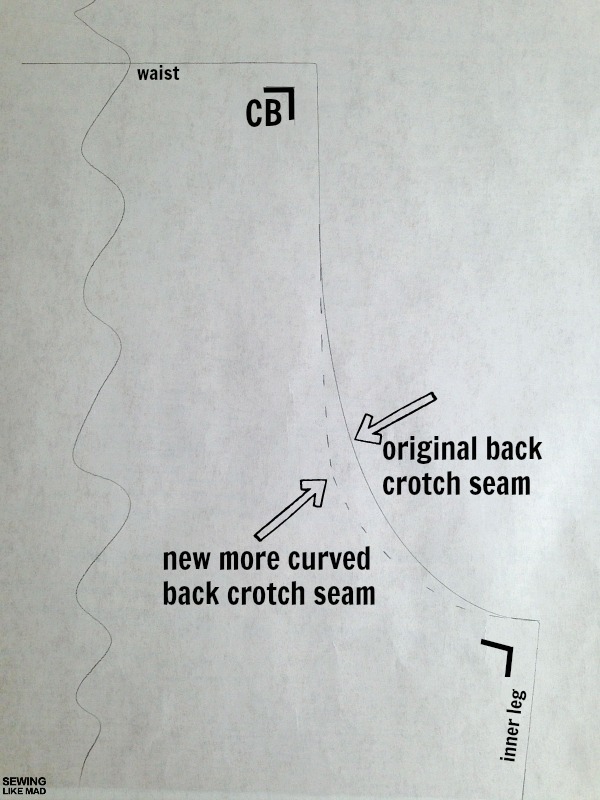 Here is a random pants pattern that I just quickly drew for a more visual explanation of curving the back crotch seam. If you have already sewed the pants (which you usual have before you realize the problem) then you simply sew where the stitched line is and cut off the excess fabric. My new curved line is just random, sometimes you need more, sometimes less. Only actually doing it and playing around with it, can tell you what is the right curve for your unique behind. And can I just add that this is one of those times where you end up sewing in your underwear because the pants need to go on and off and on again and usually several times more than that. Fun times. Not to mention the awkward situation where you are trying to catch a glimpse of your own behind in the mirror, gah. (A hand mirror helps here). I did a little design change too on this pair. An exposed bright orange back waist elastic instead of the original version - which is a fabric waistband with an elastic pulled through. I have another pair further down in this post with that feature so you can see them both. If you wonder how that can be done with a nice inside finish check out THIS tutorial of mine. I really love the pop of color that it gives. The fabric is this glorious Brussels Washer Yarn Dye linen and rayon blend from Robert Kaufman. There is also the regular Brussels Washer collection where the colors are more solid - as opposed to a more heathered look in the yarn dye collection. 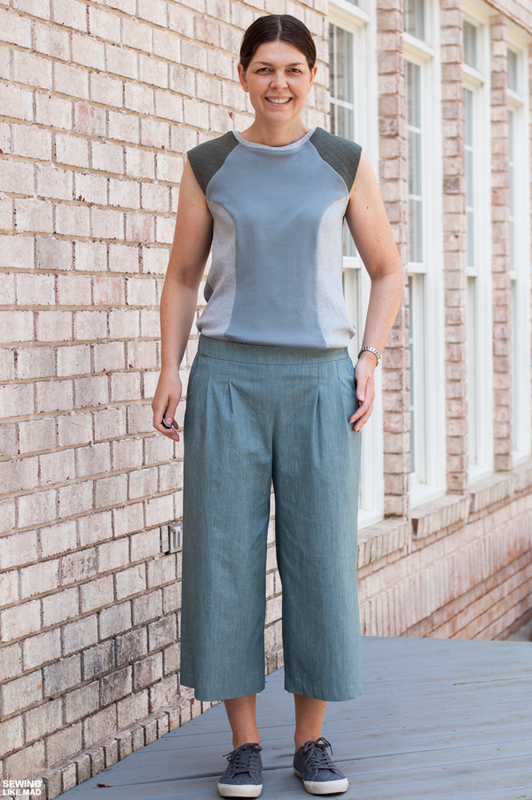 They are all ultra soft and have the absolutely perfect drape for these pants. Which takes me to the next pair I made....with not so perfect fabric, ugh. 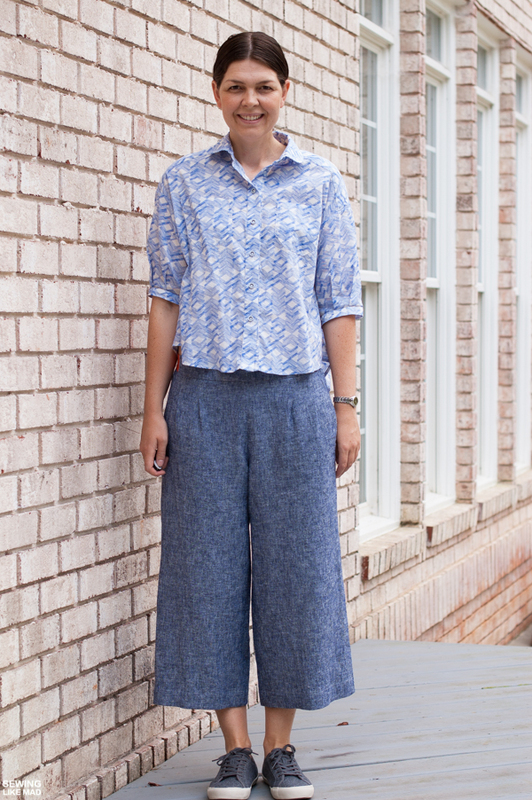 This pair is made with the EXACT same pattern but they do not at all look as good as the linen pair. The fabric is lovely enough. It's Cool Foliage from Art Gallery's new-ish denim line but in hindsight it's just too crispy. I guess that's the best way to explain it. They look okay when I stand absolutely still and straight but as soon as I move, hell breaks loose. See below. Here is a comparison photo where I stick out my one knee a tiny bit and wow, look at all those lines on my left thigh in the denim pair. 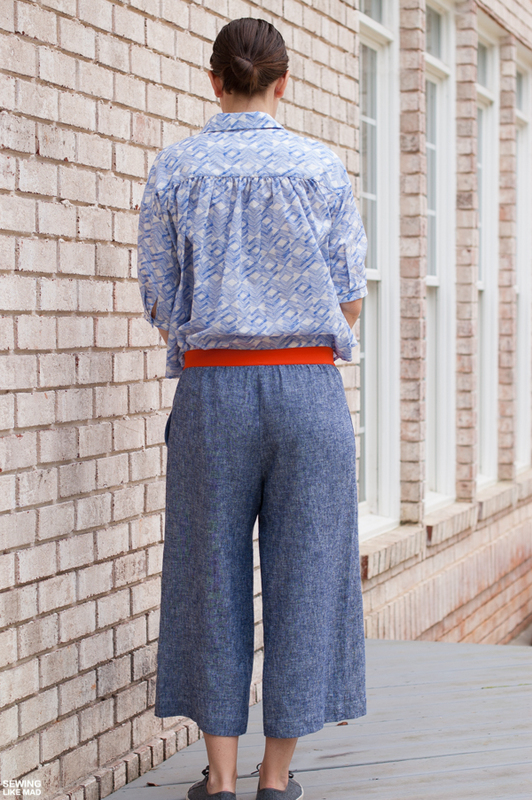 The denim IS thin and not made for regular jeans (more like denim shirts or dresses) but I thought it would be an advantage for these loose fitting pants, but we all live and learn and this was another great lesson for me...and hopefully you too. Let me repeat, there is nothing wrong with this fabric in general, I just don't think it works perfectly for this style. Here is a another photo, this time from behind. 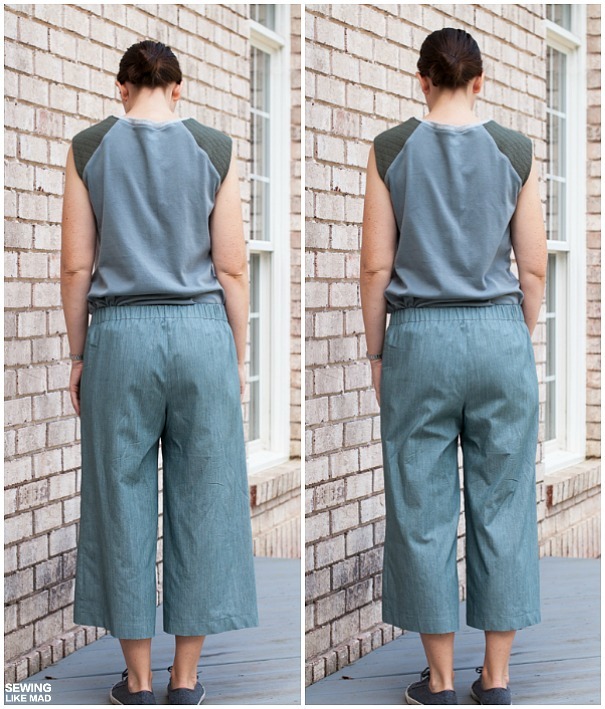 They look okay when I bend my head and upper body but I lift up and there are all sorts of weird creases on the back of my thighs that the linen pair does not have. Quite interesting I think since they are cut after the exact same pattern. So here I am, standing super straight and still haha. Yeah, these are not a total disaster but they are certainly not going to be my favorites either. A closer look of the back waistband like it is originally intended to look with a fabric waistband and an elastic pulled through. 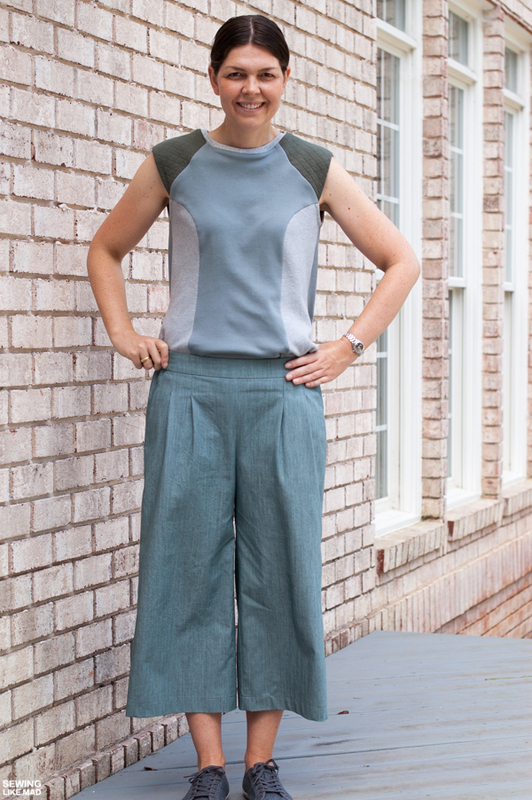 This has already been a long post and I haven't mentioned anything about the tops I'm wearing which are both sewn by me too. 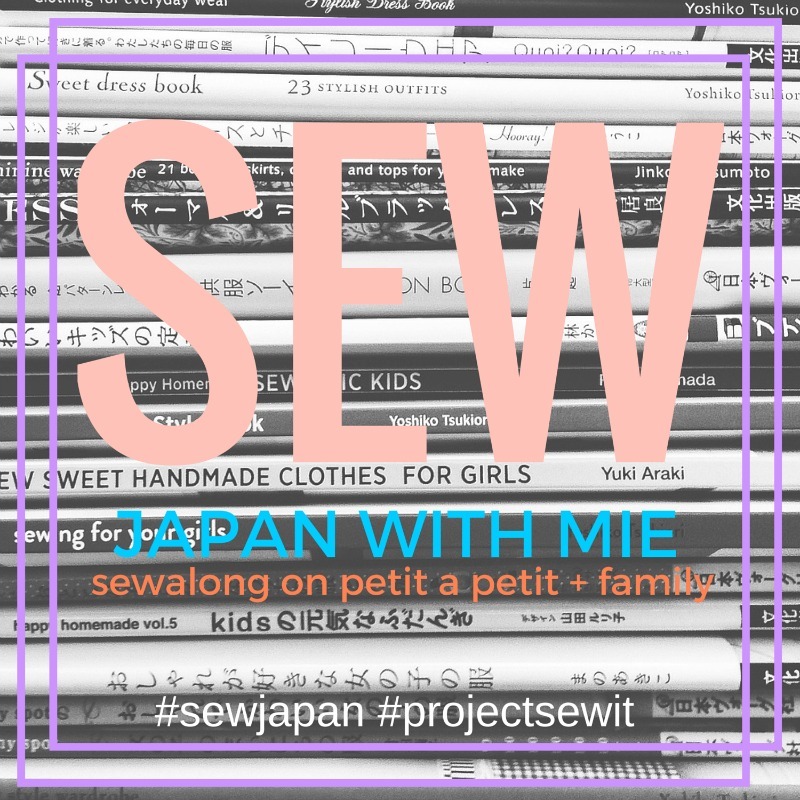 The blue and white shirt is my first version of THIS Japanese pattern that I posted about on Petit a Petit + Family for my Sew Japan with Mie series in June. 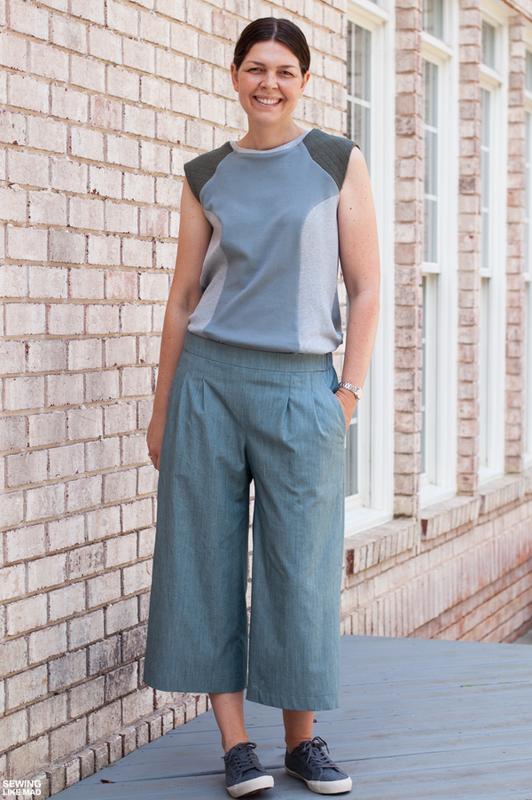 And the knit top I'm wearing above is How To Do Fashion's Kastrup Top, version 3. I have plans of making all 3 versions before I'm blogging them so consider this a little preview. 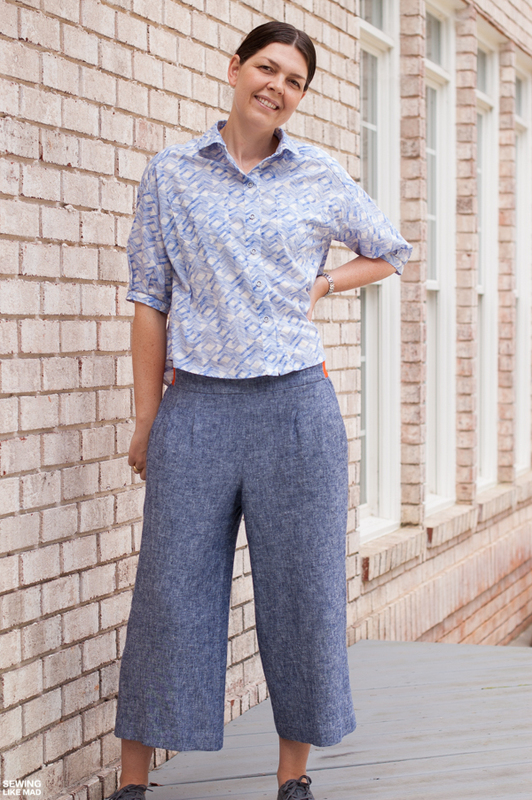 Get your own Emerson Crop Pants pattern HERE. You look fabulous as usual! Another great sewing lesson about fabrics. If you hadn't mention the way the fabric moves in the second pair, I wouldn't give it any attention, but it does make a difference! Love the exposed elastic and the colour is perfect! Can't wait to see the rest of your versions for the How to do fashion's patterns. What a wonderful and informative post! Thanks for the the visual on how to curve the back crotch seam, this is something that happens to me all the time, I thought it would be a more complicated fix. So good. They look great. I just love that exposed elastic, brilliant! And that second fabric also doesn't photograph well- just saying! 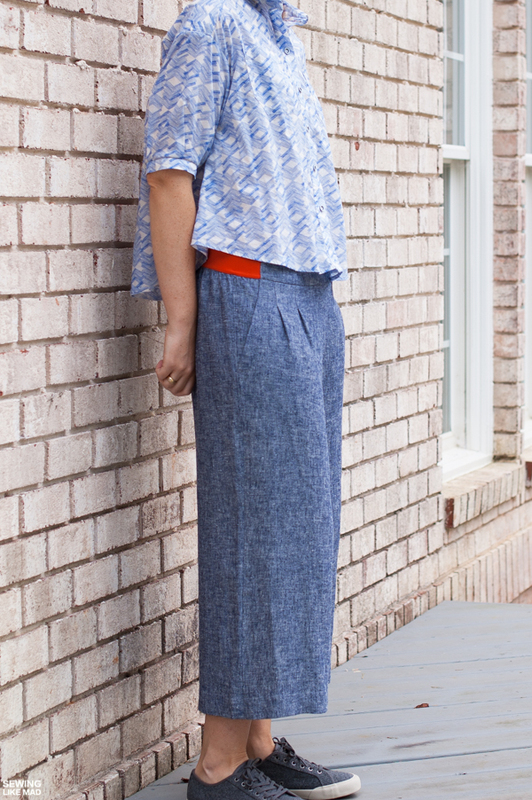 I love the color combo of your knit top, and I love the orange elastic! So Good!! Love both pairs but that exposed elastic goes so perfect! <3 This is a great post and I love the comparison between the two, and all the information on curving the back seam, I totally should have made that on the Alexandria I made last year, now I know how to fix it for the next pair, thank you master. ;) Ohh and that top from How to Do Fashion looks fantastic on you! Love! I really like both pairs. The first are more casual and the second have a more structured look to them. I am working on a shirt for myself...first selfish sewing for a loooong time!! Love these on you!! You know I love a pop of color :) the second pair does show wrinkles more but I still really like them...I feel like it's something you notice more in photos but not as much in person?? I think you are blowing the "problems" with the second pair out of proportion. I really am not seeing the issue with them, and if those are issues, it isn't anything greater than any other RTW pair of pants. Wrinkles happen when we move. no big deal. right? I think someone with your background and experience, high expectations are not too much. I must be reacting to the ridiculous amount of "let me point out this minor flaw on my perfectly wearable garment" that happens in sewing blogs. I've done it, and I'm trying to get away from it, because frankly the sewing police is not going to arrest you for things that are deemed "acceptable" by the RTW fashion industry. Ah Mie! You are fabulous! 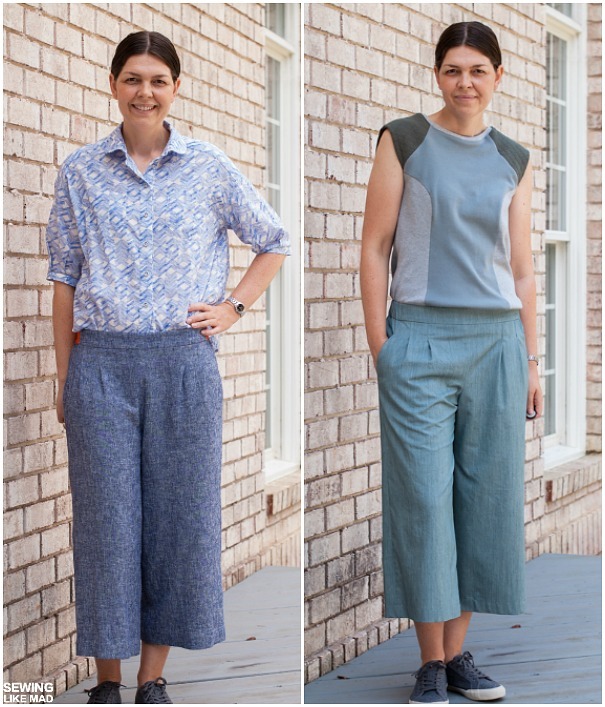 Love the looks- especially the first pair of pants and the second shirt. Do you think the second pair of pants will relax with washing and drying? Thank you Emily! And I'm hoping they will relax a little over time :-) Yesterday I styled them with a long tee and that worked out great! So they will definitely get used now. Fab.Ul.Ous. Yep. That's about all I can say. They really do look fab, especially the linen pair. I love this style of pants. They look and feel great. Mie, I love the way you take the time to go into so much detail with your posts. I always learn so much! I feel like it's only been in the last year or two that I am really understanding how patterns can be affected so dramatically simply by using different fabrics. What a great side by side comparison. I made a pinafore for Iris in that exact same denim. It is a bit crisp now that you mention it. 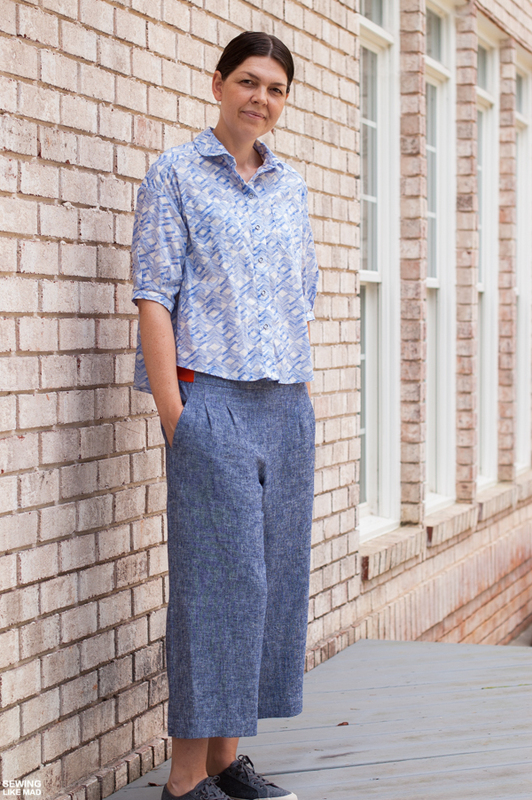 Well, you can never go wrong with linen, can you? Nope. Never. :) Lovely post, as always! Mwah! 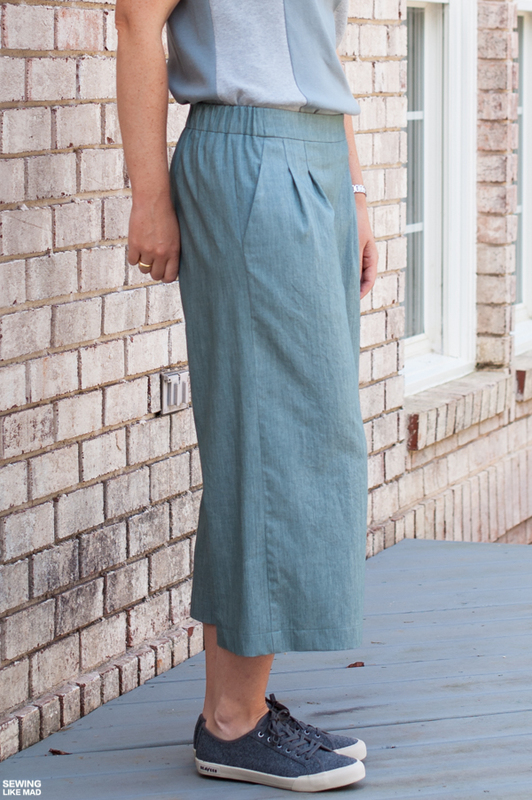 Skirt with Exposed Elastic Waist - Tutorial.